WASHINGTON, DC, September 21, 2012 (ENS) – Today, on the fall equinox, the moonrise is aligned with the two pinnacles at Chimney Rock in southwestern Colorado, one of only four days each year when this alignment occurs. Timing his action to coincide with this natural alignment, President Barack Obama today signed a Proclamation establishing Chimney Rock as a National Monument. Atop these ancient sandstone formations, Ancestral Pueblo People built what Obama termed “exquisite stone buildings,” including the highest ceremonial ‘great house’ in the Southwest. 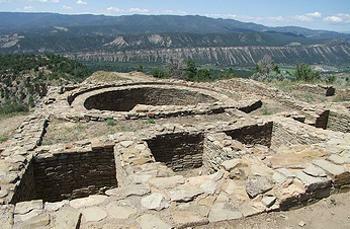 The Chaco-style communal multi-room great house was built in the late 11th century to command observations of the surrounding landscape and astronomical phenomena. 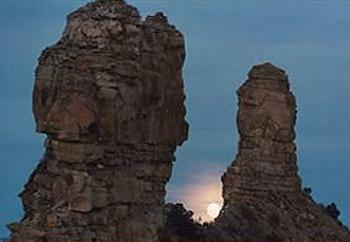 Every 18.6 years, during the northern lunar standstill, the moonrise is aligned with the site’s two rock pinnacles, as well as during the summer and winter solstices, and the fall and spring equinoxes. At these times, descendants of the Ancestral Pueblo People return to Chimney Rock for spiritual and traditional purposes. Migratory mule deer and elk herds pass through the area each fall and spring as they have for thousands of years, and live there during the critical winter months. Merriam’s turkeys, river otters, bald eagles, golden eagles, mountain lions, bats, woodpeckers, and many species of migratory birds also live in the area among the Ponderosa Pine, pinon, and juniper, the Proclamation states. Desert plants usually found farther south grow there, including a species of cholla cactus that does not occur naturally outside the Sonoran Desert, believed to have been cultivated by the Ancestral Pueblo People. In 1970, Chimney Rock was listed on the National Register of Historic Places, and its spectacular landscape has been open to visitors since then. President Obama made Chimney Rock a National Monument by using his powers under the Antiquities Act with support from Colorado officials, the Native American community, local businesses and other stakeholders. A 2010 attempt to obtain national monument status for Chimney Rock by Congressional action was blocked on the Senate floor by a minority of senators. 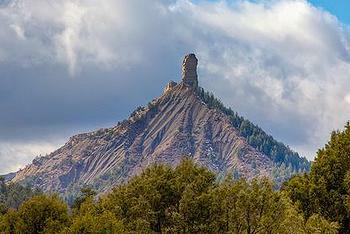 Chimney Rock is the third National Monument designated by President Obama using the Antiquities Act. He previously designated Fort Monroe National Monument in Virginia, a former Army post integral to the history of slavery, the Civil War, and the U.S. military, and Fort Ord National Monument in California, a former military base that is a world-class destination for outdoor recreation. First exercised by President Theodore Roosevelt in 1906 to designate Devils Tower National Monument in Wyoming, the authority of the Antiquities Act has been used by 16 presidents since 1906 to protect unique natural and historic features in America, such as the Grand Canyon, the Statue of Liberty, and the Northwestern Hawaiian Islands Marine National Monument. The 4,726 acre Chimney Rock National Monument will be managed by the USDA Forest Service in collaboration with tribal, community, state, and Federal partners. It is the seventh National Monument to be managed by the agency. U.S. Senator Michael Bennet of Colorado today said, “This is the culmination of years of hard work and team work by Coloradans who recognize Chimney Rock for the spectacular site that it is. When the local communities asked me to engage in these efforts, I was thrilled to take their message to Washington. Gene Karpinski, president of the League of Conservation Voters and Pete Maysmith, executive director of Colorado Conservation Voters, applauded President Obama’s leadership in protecting Chimney Rock for future generations. “Recognizing and preserving a spectacular place that evokes Colorado’s heritage of unique landscapes boosts local economies by driving tourism and recreation, which is why people all across Colorado support the decision to make Chimney Rock a National Monument,” they said.